StarSat is the brand that replaced TopTV, and was officially launched on 31 October 2013. The new packages and channels were available from 1 December 2013. The new StarSat decoder is fully HD. StarSat is a satellite TV network competing with Multichoice DStv in the domestic satellite TV market. StarSat was originally expected to provide a low cost alternative to DStv and create genuine competition. However lacking the ability to broadcast live South African soccer and rugby has proved a major disadvantage to TopTV. Also since DSTV subsequently provided a range of low cost bouquets, the R99 per month bouquet of TopTV is no longer price competitive. StarSat is a digital satellite TV brand, operating in the South African market, offering a multitude of channels available in simple package choices for the subscriber. The channels include movies, news, series, kids programmes, music, gospel, documentaries, sport, lifestyle, telenovelas, and other. The packages are priced to give the subscriber good viewing value, and to make digital TV available to everyone. StarSat is the brand that replaced TopTV, and was officially launched on 31 October 2013. 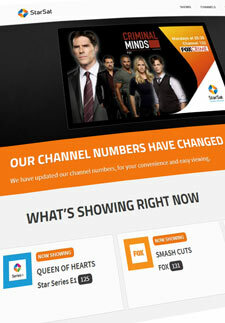 The new packages and channels will be available on 1 December 2013. The new StarSat decoder is fully HD. Existing or lapsed TopTV subscribers will be able to receive the StarSat signal on the TopTV decoder. The decision of StarSat to not allow their accredited installer network to sell and supply the StarSat decoder, lost StarSat many subscribers, because the only product which the StarSat accredited installer could then sell his customer was DStv. Check out their TV Guide. View their Shows. 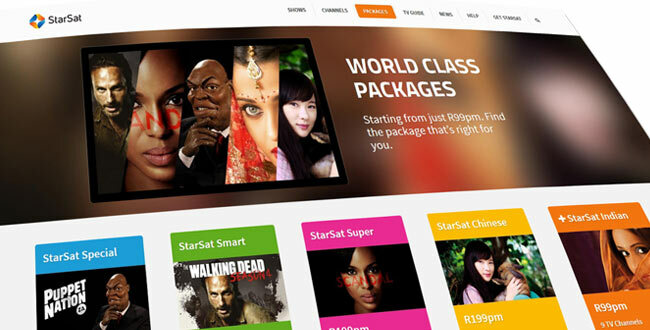 Find out what StarSat Packages are availabe, starting at R99pm. TV + Video Doctor is your StarSat accredited installer in Centurion and Pretoria. We can help you if your StarSat LNB has been damaged by lightning or you are relocating your StarSat dish to your new home. Contact us on 012 664 5223 to install or repair your StarSat satellite dish. On Digital Media (Pty) LTD (ODM) is a proudly South African incorporated company with effective BEE shareholding of 68%. The company was awarded an ICASA Pay TV License on 12 September 2007 and issued the license on 9 July 2008 but started its operations in 2010. We offer easy access to commercial satellite subscription service for many South Africans who have historically been left out. In addition, we have local and international investors from the financial and industrial sectors, resulting in a significant economic boost to the South African broadcasting industry. On the technology front our audiences are assured of the latest state of the art digital broadcasting technology including MPEG-4 and DVB-S2. We possess a powerful combination of technical capability and industry expertise, both at shareholding and management levels, which has since seen a significant and exciting impact on the Pay TV market.